In order to design better search experiences, we need to understand the complexities of human information-seeking behaviour. In this paper, we propose a model of information behavior based on the needs of users of consumer-oriented websites and search applications. The model consists of a set of search modes users employ to satisfy their information search and discovery goals. We present design suggestions for how each of these modes can be supported in existing interactive systems, focusing in particular on those that have been supported in interesting or novel ways. In order to design better search experiences, we need to understand the complexities of human information-seeking behaviour. To this end, numerous models have been proposed, at varying levels of abstraction (e.g. , , ). However, despite their evident value as analytical frameworks and their popularity among researchers (Bates’ Berrypicking model has been cited over 1,000 times, for example), few of these have gained significant traction within the user experience design community, and fewer still are adopted as part of the mainstream working practices of design practitioners. In part, a lack of adoption may be simply a reflection of imperfect channels of communication between the research and design communities. However, it may also reflect a conceptual gap between research insights on the one hand and appropriate design interventions on the other. In this paper, we present a model of information behavior derived directly from the activities of stakeholders involved in the development of commercial search applications . This model represents a further iteration on an earlier model based on the needs of enterprise search users , extended to address the domain of site search, i.e. consumer-oriented websites and search applications. The model consists of a set of ‘search modes’ that users employ to satisfy their information search and discovery goals. It extends the IR concept of information-seeking to embrace a broader notion of discovery-oriented problem solving, addressing a wider range of information interaction and information use behaviours. The overall structure reflects Marchionini’s framework , consisting of three lower-level ‘lookup’ modes (locate, verify, monitor), three ‘learn’ modes (compare, comprehend, explore) and three higher-level ‘investigate’ modes (analyze, evaluate, synthesize). We discuss these modes and present suggestions for how they can be supported in the design of consumer-oriented search and discovery applications. We also reflect on the general utility of such models and frameworks, and explore briefly the qualities that might facilitate their increased adoption by the design community. 1. Locate: To find a specific (possibly known) item. This mode encapsulates the stereotypical ‘findability’ task that is so commonly associated with site search, consistent with (but a superset of) Spencer’s  known item search mode. 2. Verify: To confirm that an item meets some specific, objective criterion. Often found in combination with Locate, this mode is concerned with validating the accuracy of some data item, comparable to that proposed by Ellis et al. .
3. Monitor: Maintain awareness of the status of an item for purposes of management or control. This activity focuses on the state of asynchronous responsiveness and is consistent with that of Bates , O’Day and Jeffries , Ellis , and Lamantia . 4. Compare: To identify similarities & differences within a set of items. This mode has not featured prominently in previous models (with the possible exception of Marchionini’s), but was found to be a significant element within enterprise search . It is also a common feature on many ecommerce sites. 5. Comprehend: To generate independent insight by interpreting patterns within a data set. Like compare, this mode was found to be a key element of the enterprise search scenarios, and also features in the models of Cool & Belkin  and Marchionini . 6. Explore: To investigate an item or data set for the purpose of knowledge discovery. In some ways the boundaries of this mode are less prescribed than the others, but what the instances share is the characteristic of open ended, opportunistic search and browsing in the spirit of O’Day and Jeffries  exploring a topic in an undirected fashion and Spencer’s  exploratory. 7. Analyze: To examine an item or data set to identify patterns & relationships. This mode features less prominently in previous models, appearing as a sub-component of the processing stage in Meho & Tibbo’s  model, and overlapping somewhat with Cool & Belkin’s  organize. This definition is also consistent with that of Makri et al. , who defined analysing as “examining in detail the elements or structure of the content found during information-seeking” (p. 630). 8. Evaluate: To use judgement to determine the value of an item with respect to a specific goal. This mode is similar in spirit to verify, in that it is concerned with validation of the data. However, while verify focuses on simple, objective fact checking, our conception of evaluate involves more subjective, knowledge-based judgement, similar to that proposed by Cool & Belkin . 9. Synthesize: To create a novel or composite artefact from diverse inputs. This mode also appears as a sub-component of the processing stage in Meho & Tibbo’s  model, and involves elements of Cool & Belkin’s  create and use. Of all the modes, this one is the most commonly associated with information use in its broadest sense (as opposed to information seeking). Each of the modes describes a type of interactive behavior may need to be supported by a particular information system. For example, an online retail site should support locating and comparing specific products, and ideally also comprehending differences and evaluating tradeoffs between them. Likewise, an enterprise application for electronic component selection should support monitoring and verifying the suitability of particular parts, and ideally also analyzing and comprehending any relevant patterns and trends in their lifecycle. By understanding the anticipated search modes for a given system, we can optimize the design to support specific user behaviors. In the following section we consider examples of particular search modes and explore some of their design implications. This mode encapsulates the stereotypical ‘findability’ task that is so commonly associated with site search. But support for this mode can go far beyond simple keyword entry. For example, by allowing the user to choose from a list of candidates, auto-complete transforms the query formulation problem from one of recall into one of recognition (Figure 1). Likewise, Amazon’s partial match strategy deals with potentially failed queries by identifying the keyword permutations that are likely to produce useful results. Moreover, by rendering the non-matching keywords in strikethrough text, it facilitates a more informed approach to query reformulation (Figure 2). 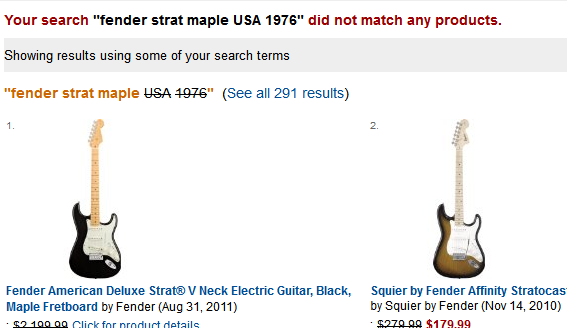 In this mode, the user is inspecting a particular item and wishing to confirm that it meets some specific criterion. Google’s image results page provides a good example of this (see Figure 3). On mouseover, the image is zoomed in to show a magnified version along with key metadata, such as filename, image size, caption, and source. This allows the user to verify the suitability of a specific result in the context of its alternatives. Likewise, there may be cases where the user needs to verify a particular query rather than a particular result. In providing real-time feedback after every key press, Google Instant supports verification by previewing the results that will be returned for a given query (Figure 4). If the results seem unexpected, the user can check the query for errors or try alternative spellings or keyword combinations. The Compare mode is fundamental to online retail, where users need to identify the best option from the choices available. A common technique is to provide a custom view in which details of each item are shown in separate columns, enabling rapid comparison of product attributes. 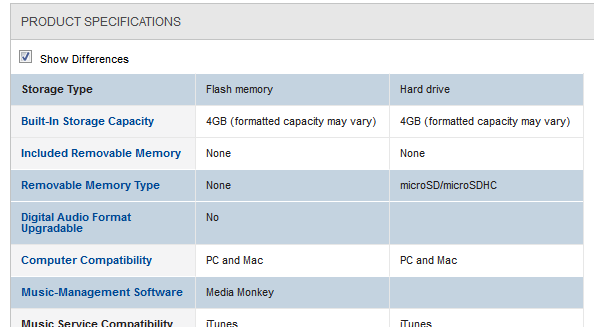 Best Buy, for example, supports comparison (and analysis) by organising the attributes into logical groups and automatically highlighting the differences (Figure 5). But comparison is not restricted to qualitative attributes. In financial services, for example, it is vital to compare stock performance and other financial instruments with industry benchmarks. 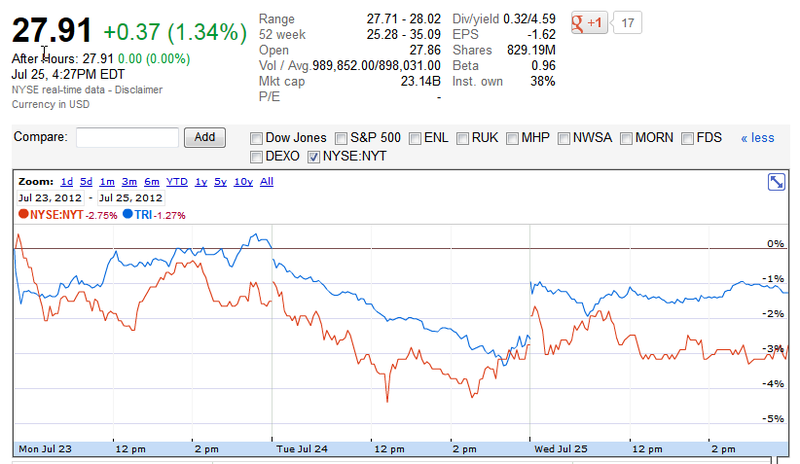 Google Finance supports the comparison of securities through a common charting component (Figure 6). A key principle in exploring is differentiating between where you are going and where you have already been. In fact, this distinction is so important that it has been woven into the fabric of the web itself; with unexplored hyperlinks rendered in blue by default, and visited hyperlinks shown in magenta. Amazon takes this principle a step further, through components such as a ‘Recent Searches’ panel showing the previous queries issued in the current session, and a ‘Recent History’ panel showing the items recently viewed (Figure 7). Another simple technique for encouraging exploration is through the use of “see also” panels. Online retailers commonly use these to promote related products such as accessories and other items to complement an intended purchase. 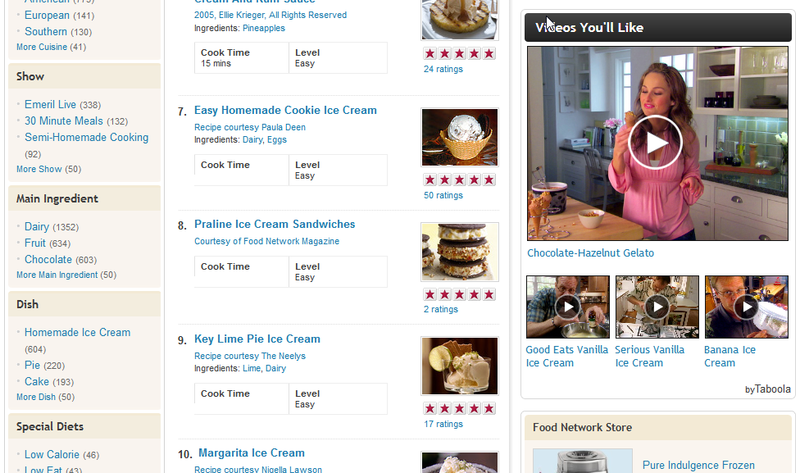 An example of this can be seen at Food Network, in which featured videos and products are shown alongside the primary search results (Figure 8). A further technique for supporting exploration is through the use of auto-suggest. While auto-complete helps users get an idea out of their heads and into the search box, auto-suggest throws new ideas into the mix. In this respect, it helps users explore by formulating more useful queries than they might otherwise have thought of on their own. 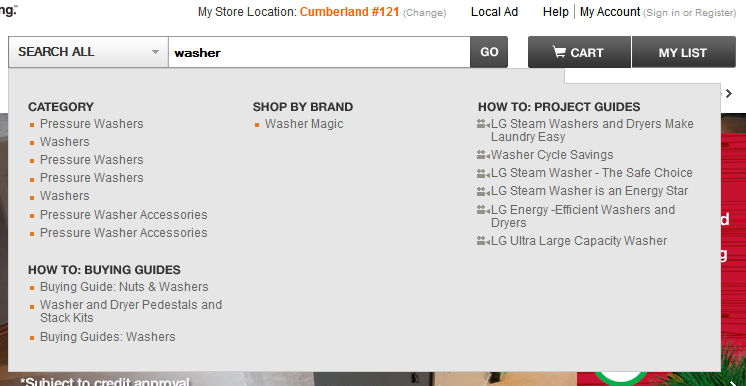 Home Depot, for example, provides a particularly extensive auto-suggest function consisting of product categories, buying guides, project guides and more, encouraging the discovery of new product ideas and content (Figure 9). In modes such as exploring, the user’s primary concern is in understanding the overall information space and identifying areas to analyze in further detail. Analysis, in this sense, goes hand in hand with exploring, as together they present complementary modes that allow search to progress beyond the traditional confines of information retrieval or ‘findability’. A simple example of this can be found at Google patents (Figure 10). 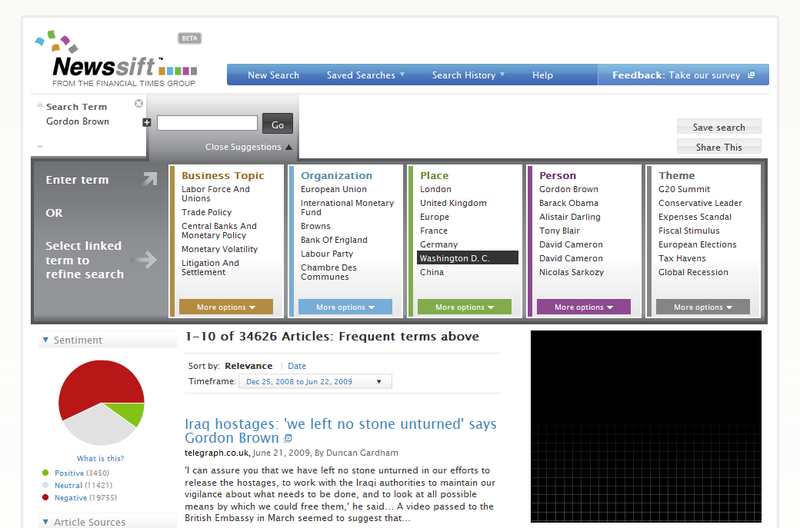 The alternate views (Cover View and List View) allow the user to switch between rapid exploration (scanning titles, browsing thumbnails, looking for information scent) and a more detailed analysis of each record and its metadata. In the above example the analysis focuses on qualitative information derived from predominantly textual sources. Other applications focus on quantitative data in the form of aggregate patterns across collections of records. NewsSift, for example, provided a set of data visualizations which allowed the user to analyze results for a given news topic at the aggregate level, gaining an insight that could not be obtained from examining individual records alone (Figure 11). The design examples above represent illustrations of individual modes, showing various ways in which they can be supported. However, a key feature of the model is its emphasis on the combinatorial nature of modes and the patterns of co-occurrence this reveals . In this respect, its true value (and arguably the real design challenge) is in translating these patterns into meaningful user journeys through the task and information space. The process of mapping from modes to design interventions also reveals further observations on the utility of information models in general. For example, for any given model, the degree of adoption by the design community may reflect the size of the conceptual gap between research insights and the design interventions needed to support them. It is likely that the most immediately valuable models will need to strike a balance between flexibility (the ability to address a variety of domains and problems), generative power (the ability to express complex patterns of behaviour) and an appropriate level of abstraction (such that design insights are readily available; or may be inferred with minimal speculation). By illustrating ways in which modes can be supported in specific search applications, we have made a practical contribution that helps bridge the gap between investigating search behaviour and designing applications to support such behaviour. We believe that an important way to increase adoption of any given model is through the use of practical examples. These examples serve to illustrate the boundaries and scope of the behaviours encompassed by the model and minimise the creative ‘leap’ required by practitioners in applying a model to design. An on-going challenge is to identify new information behaviours as the landscape of interactive systems evolves and to identify novel ways that such behaviours can be supported through design. Bates, Marcia J. 1979. Information Search Tactics. Journal of the American Society for Information Science 30, 205-214. Cool, C. & Belkin, N. 2002. A classification of interactions with information. In H. Bruce (Ed. ), Emerging Frameworks and Methods: CoLIS4: proceedings of the 4th International Conference on Conceptions of Library and Information Science, Seattle, WA, USA, July 21-25, 1-15. Ellis, D. 1989. A Behavioural Approach to Information Retrieval System Design. Journal of Documentation, 45(3), 171-212. Ellis, D., Cox, D. & Hall, K. 1993. A Comparison of the Information-seeking Patterns of Researchers in the Physical and Social Sciences. Journal of Documentation 49(4), 356-369. Ellis, D. & Haugan, M. 1997. Modelling the Information-seeking Patterns of Engineers and Research Scientists in an Industrial Environment. Journal of Documentation 53(4), pp. 384-403. Lamantia, J. 2006. 10 Information Retrieval Patterns JoeLamantia.com. [Available: http://www.joelamantia.com/information-architecture/10-information-retrieval-patterns%5D. Makri, S., Blandford, A. & Cox, A.L. 2008. Investigating the Information-Seeking Behaviour of Academic Lawyers: From Ellis’s Model to Design. Information Processing and Management 44(2), 613-634. Marchionini, G. 2006. Exploratory search: from finding to understanding. Communications of the ACM 49(4), 41-46. Meho, L. & Tibbo, H. 2003. Modeling the Information-seeking Behavior of Social Scientists: Ellis’s Study Revisited. Journal of the American Society for Information Science and Technology 54(6), 570-587. O’Day, V. & Jeffries, R. 1993. Orienteering in an Information Landscape: How Information Seekers get from Here to There. INTERCHI 1993, 438-445. Russell-Rose, T., Lamantia, J. and Burrell, M. 2011. 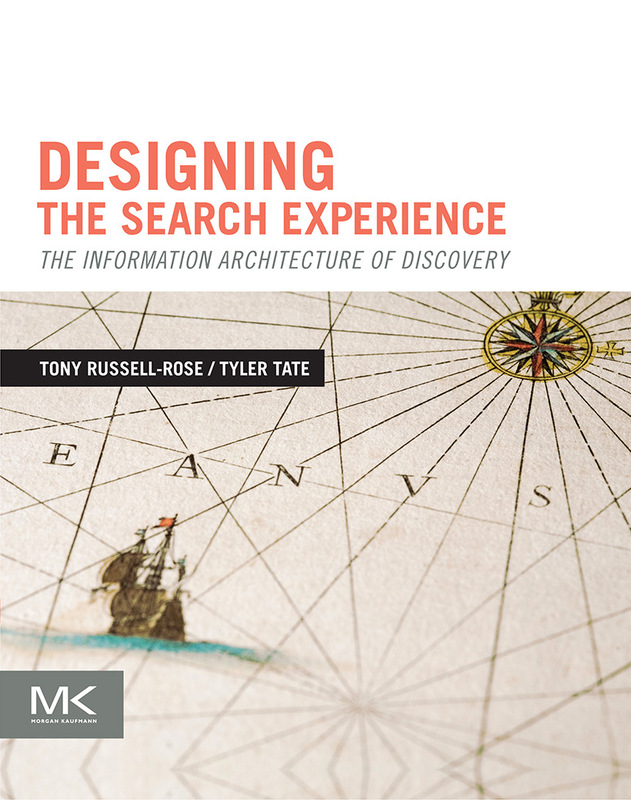 A Taxonomy of Enterprise Search and Discovery. Proceedings of HCIR 2011, California, USA. Russell-Rose, T. and Makri, S. (forthcoming). A Model of Consumer Search Behavior. Proceedings of EuroHCIR 2012, Nijmegen, Netherlands.